The Toronto Maple Leafs always had suspect defense. Right now, it’s falling apart. Given the tendency and reputation of the Toronto media, I will try to strike a balance here between legitimate concern and panicky hyperbole. But you’ll have to forgive me if I don’t succeed – 20+ goals in four games will do that to a person. First the good: the Toronto Maple Leafs are a young team, with a seasoned, respected coach. They are in their first post-rebuild year and they have the assets to get better. So some patience is required. But holy crap, not that much. When it comes to the Toronto Maple Leafs defense, I’m of two minds. On one hand: The Defense features two core, top-pairing players (Gardiner and Rielly), two young, high-potential players (Zaitsev and Carrick), two duds and a solid, if low-impact vet (Marincin). This is as good a set-up in year one (post-rebuild) as you’re apt to find. Patience is required. On the other hand: The Leafs have a short window where Marner, Matthews and Nylander cost pennies on the dollar and they could definitely use an upgrade. The thing is, this isn’t the year they win it all. If they miss the Playoffs, they could still win the lottery. If they make the Playoffs, they could pull some upsets – no likely situation is untenable. My conclusion is that the Leafs should be patient. If Taylor Hall only gets you Adam Larsson, then who cares what a top-pairing dman costs, because you’re not getting one. You have to develop one. It really is a simple equation: the opportunity cost of not adding a defenseman right now is zero. The cost of getting one is high, and therefore the risk/reward says that they should solidify their bottom pairing and be patient. The Leafs’ problem is two-fold. The first thing causing their bad defense is that no team that wants to realistically make the Playoffs plays Hunwick and Polak so much, or at all. 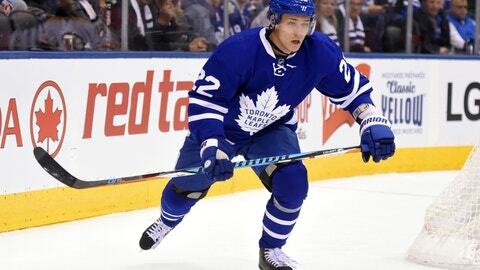 The second, and way bigger problem is Zaitsev. I know his position as Rielly’s partner makes people think he’s good, but he’s not. Carrick and Gardiner are one of the NHL’s most effective pairings. Carrick is not the problem. In fact, Carrick is probably the Leafs best chance of developing a non-first-round defenseman into an elite player like Subban, Keith, Josi or Muzzin. Zaitsev is the main problem here. He is 25, he’s a rookie and he’s got some potential. But if you think Zaitsev playing top-pairing minutes in the NHL is a good idea, then you may have a drug problem. With Zaitsev on the ice, the Toronto Maple Leafs consistently allow more shots than they get. When Morgan Rielly gets away from him, Rielly becomes a 50%+ possession player. The answer is simple: Rielly needs a partner and Zaitsev needs to play further down the lineup – possibly replacing Hunwick on the bottom pair. The Leafs don’t need to acquire a top-flight star like Shattenkirk – they just need someone competent for Morgan Rielly to play with. Fixing this really isn’t that hard. The Toronto Maple Leafs don’t even have to make a trade. Just play Gardiner and Carrick more, have Marincin replace Zaitsev with Rielly, and have Zaitsev take Hunwick’s spot with Polak. Better players need to be eventually required, but for now, that should help alot.